What is an Enrichment Summer Camp for Middle School Students and How Can it Prepare Students For High School? Home / What is an Enrichment Summer Camp for Middle School Students and How Can it Prepare Students For High School? Summer is supposed to be relaxing and fun. However, long school breaks can lead to learning loss that education experts call the summer slide. Over time, this can have a noticeable impact on academic performance and can make starting a new school year especially difficult. Parents can fight the summer slide with reading lists, organized sports, and music lessons. These activities, however, don’t always offer the stimulation that intelligent and curious children need to keep their minds active. Help students continue learning and make their summer more valuable without sacrificing the fun. Middle school summer camps keep kids engaged while offering opportunities to work and socialize with peers. How can an enrichment camp prepare your child for the demands of high school? Students work with instructors and peers to tackle assigned problems. They learn how to collaborate with people of all ages to complete common goals, which is an important skill for later in life. Enrichment programs don’t rely on grades to gauge performance. Students are driven by a sincere desire to learn and interest in the subject; learning happens naturally and easily. Enrichment middle school summer camps are outcome-based. Whether it’s an original song or first place in the camp’s tournament, students leave with proof of their accomplishments. These trophies can provide extra motivation and boost confidence when they need it. Children learn better when they’re enjoying themselves. Enrichment camps give children practical academic instruction in a fun format. Middle school is an important time in your child’s academic career, however, the experience differs vastly from HS. Middle school summer camps help students develop the mental and social skills that are essential to succeed in high school. Independence. Allowing students to spend time away from home and their parents can offer positive experiences your child can use to form their growing identity. Middle schoolers are often seeking more independence and the safe and fun environment which a camp provides can be a perfect time for that. The small daily responsibilities like waking themselves up and getting places on time can help students become more responsible. Explore New Subjects. The variety of classes and subjects available to students can keep curious minds active and excited to learn. These are often activities they wouldn't normally get to do - DJ, fashion design, cooking, or a new sport. It allows students to try new subjects, find a new area of interest or hone in on something they already love. 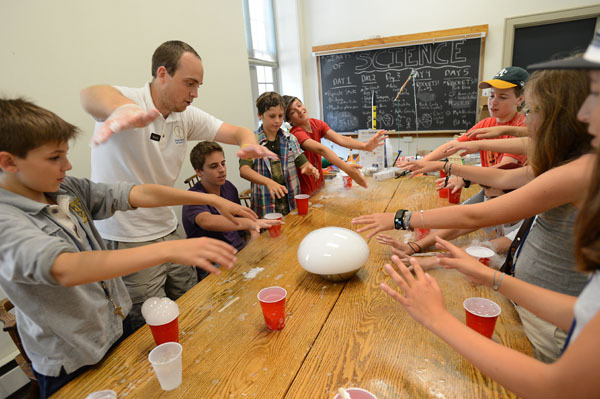 A class like like Explosive Experiments might be just the kind of class to get your middle schooler interested in science! Making new friends. It's very common for campers to have some jitters on the first day of camp, but by the end of the first day most students have found a group of other students to connect with. Connecting with new students each week is an amazing opportunity to develop their social skills. International Experience. Enrichment summer camps like Xploration have students from over 50 countries. It's an amazing opportunity for students to realize they can find something in common with someone from every corner of the globe! Campers have the opportunity to connect with people from different cultures, lifestyles, and age groups. This exposure helps students learn how to work well in a diverse group. This is not only great experience for high school, but also for college and any future profession. Confidence. By the end of camp your middle schooler will have lived on a college campus, met students from all over the world, made new friends, tried several new classes, and maybe even overcame a few challenges. All of these accomplishments can boost a student's self-esteem and help them open up and contribute more fully in academic settings. Make the most of the middle school years with Xploration residential or day summer camps located at Haverford College on the Main Line in PA. Our summer sessions offer benefits for students of all ages and skill levels. Small class sizes give instructors full control over the pace and content of lessons. Many instructors change their curriculum weekly to keep the material fresh and engaging. Middle school summer camps give your child the chance to try something new every week. When your child attends Xploration summer camp, they will make friends, gain knowledge, and develop social skills that will ease their transition into the high school years.